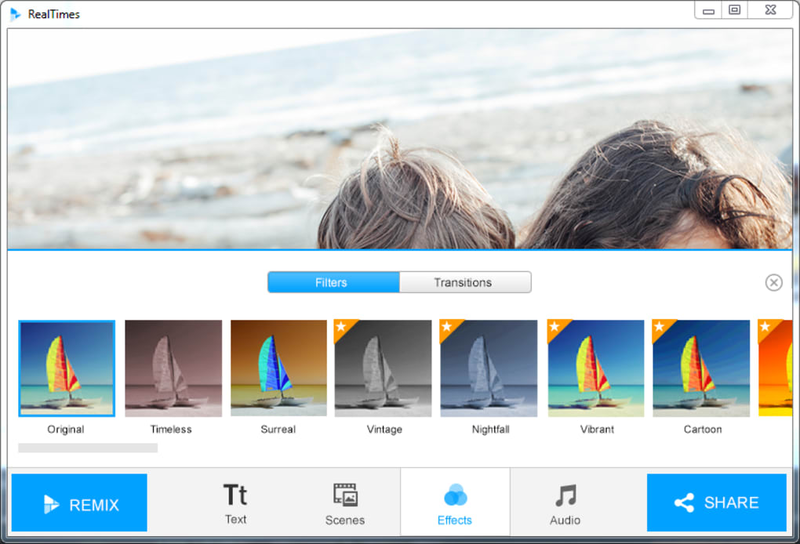 RealTimes is an app that automatically creates slideshows from your photos and videos. 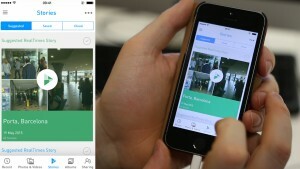 The app makes it easy to share the finished video by storing it in the cloud. Although the work is done for you, you can tweak which photos or video clips you want to use and much more. The problem RealTimes tries to solve is liberating photos and videos trapped on your phone or computer. We take a lot of photos with our phones, but how many of those photos actually get shared? 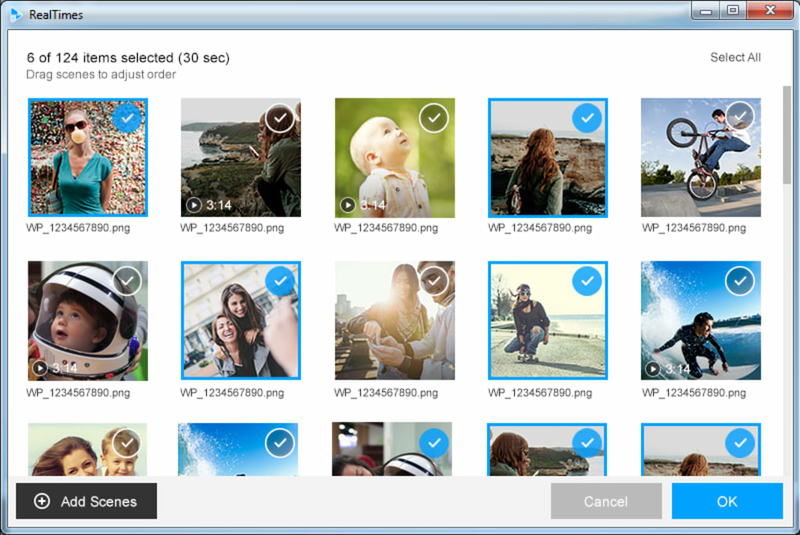 RealTimes takes the tediousness out of compiling photos and videos to share with your friends. The app uses Real's algorithm that scans your photos to pick the ones that are best. Blurry, dark, or duplicate photos are ignored so your slideshows only include the best. I found the algorithm to work well for the most part but favors faces, excluding some really good shots. Luckily, you can add them manually. If you don't like what RealTimes came up with the first time, you can hit the 'Remix' button to randomize that Story. The app also features video filters, but they're all pretty terrible. You're better off adding your own filters from Instagram or VSCO Cam before using them to create Stories in RealTimes. There's also a social network aspect to RealTimes. Your friends and family will be alerted when you add new photos, videos, or create stories. Thankfully RealTimes doesn't force users into signing up. You can still share RealTimes stories with your friends who don't have an account. Sharing a Story on Facebook shows up as an embedded video that plays right there in your friends' timeline. During my testing, Stories created by RealTimes worked flawlessly on my devices. There's no need to export your video to a specific file format. 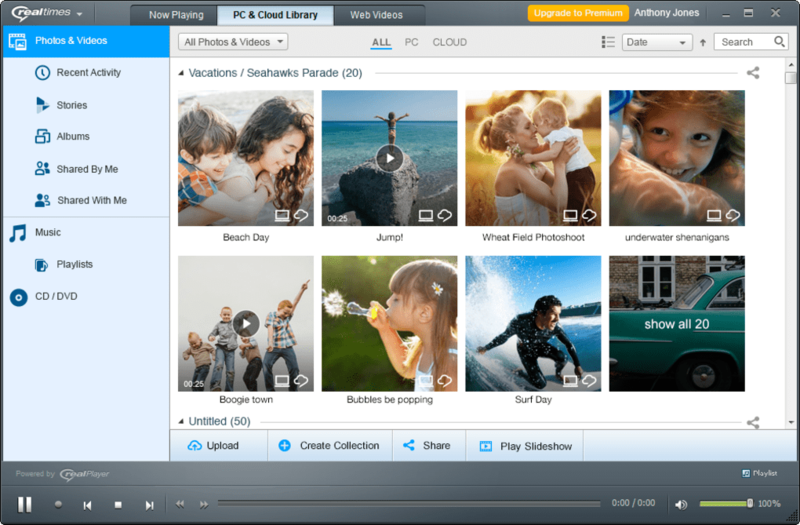 The app auto-converts the video to each platform using RealPlayer technology. One nice thing about RealTimes is that it scans all of your photos and videos, including ones you forgot about. This makes revisiting your old photos fun and a hit with your friends. RealTimes is free to use and comes with 2GB of cloud storage for free and are limited to 30 second Stories. Users can get an additional 5GB of storage for enabling Auto Upload in the app. 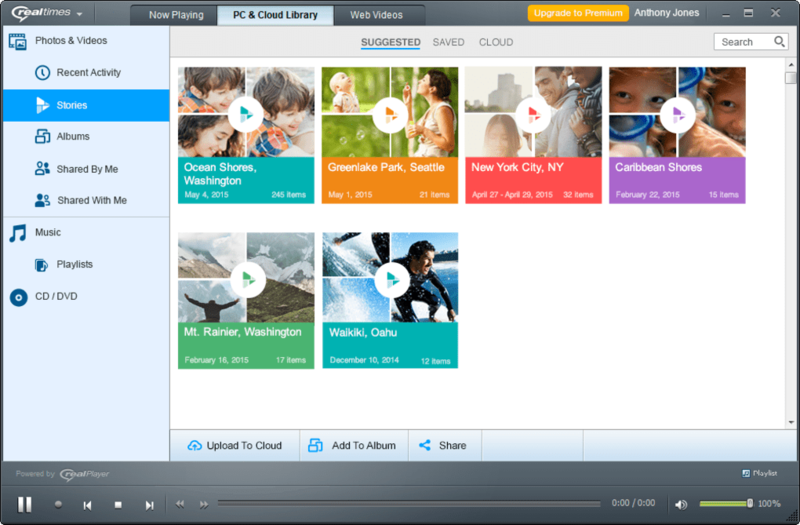 This feature automatically uploads all your photos and video clips to the cloud and will automatically be made into Stories. 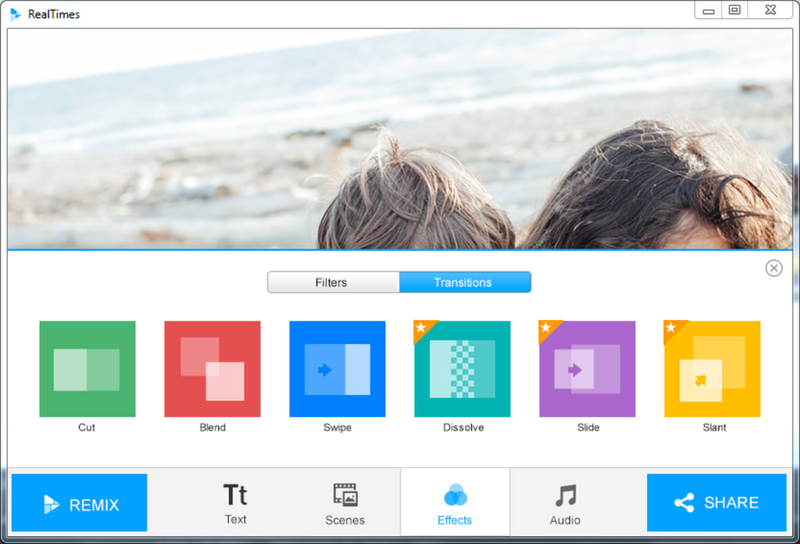 You can tweak each story before sharing, adding your own music, switching transition effects, or swapping the order of your photos and videos. Subscriptions will get you more storage and features. the $5 per month subscription nets you 25GB of cloud storage while the $10 per month plan gets you unlimited storage. Subscribers also get the ability to make longer Stories. For those who don't want to pay monthly, there is a $1 in-app purchase to unlock the ability to add more photos, change music, and remove the RealTimes watermark. It's not going to unlock everything like a subscription but it does give you a few more features. 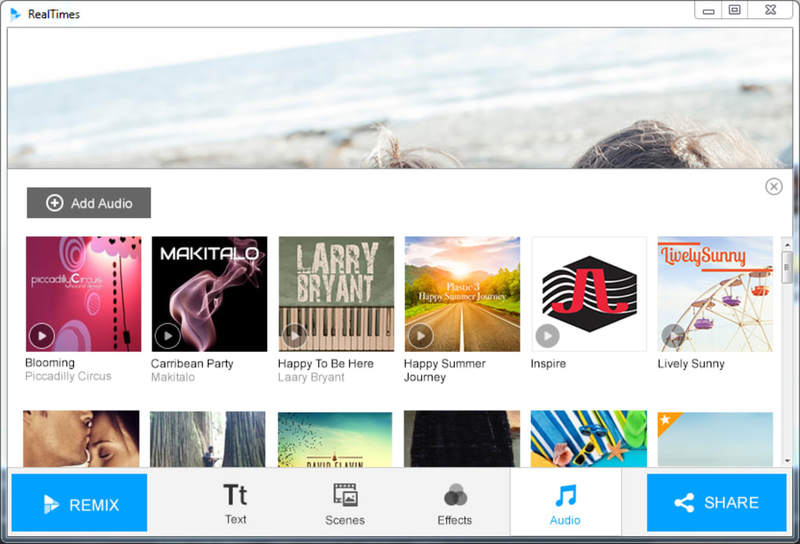 Speaking of music, there's a ton of stock music included in the app but you can add your own music if you want. You can also do a voice over for your video for a personal touch. During my testing, RealTimes for Android kept crashing when trying to add my own music but I was using a pre-release version. Another problem I found was that longer Stories took a long time to export. I created a four minute long Story that took over 30 minutes to export on my iPad. RealTimes sets out to help you organize your mess of photos on your computer, tablet, or phone and it works well. Whether or not you'll need RealTimes comes down to how social you are. If you love sharing photos and videos with your Facebook friends, RealTimes is great. If you're more of a private person and typically enjoy looking at your photos alone, you're not going to get the best of what RealTimes has to offer. Google+ also offers similar features for its users for free, making a paid subscription for RealTimes a tough sell for some. By automating the organization and sharing of your photos and videos, RealTimes helps social butterflies share their content without much work. 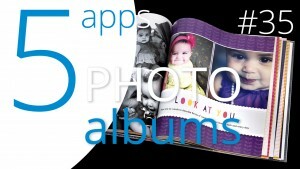 You don't have to worry about touching up every photograph or organizing albums to share. If you have a ton of photos and videos and don't know what to do with them, RealTimes is a great tool to help you organize and share them. 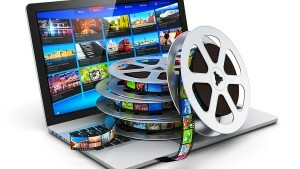 Discover and play online videos, download, save, organize and share with friends. Enjoy all your favorite videos & photos with an all-in-one media player. 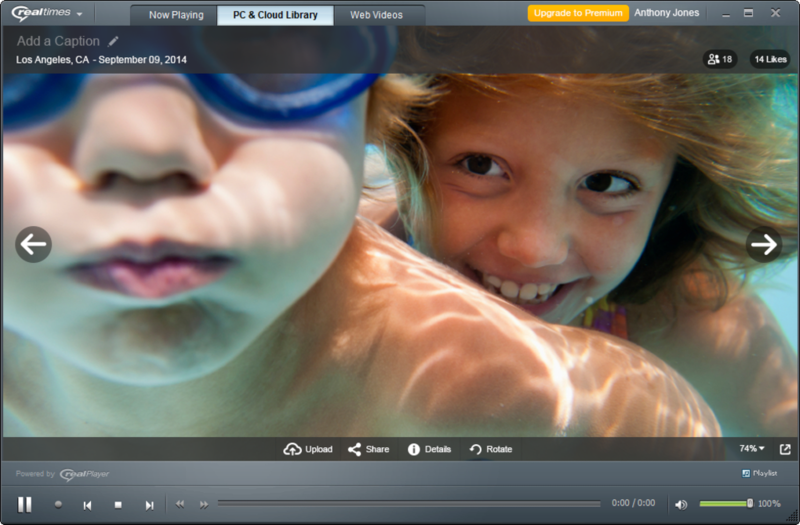 RealPlayer (with RealTimes) lets you play, share and save any video, on any device, anywhere. Free version downgrades video quality, constant "buy me" popups. I was once a fan, the product downgrade to try and force people to stop using the free version just makes them stop altogether. There are better models to encourage upgrading, like dropbox for example. The "free" video downloader alters the video and it becomes almost unwatchable. Presume to force you to buy the paid version. Seriously, if you want to demo it and put in a limit just download 5 minute limit. My view is that it seems unliekly it is still capable of downloading a video without ruining it. I'd pay a few bucks for a decent video downloader. The player now pops up buy me windows constantly, so also not a good demo. How about a time limit? Show me a decent WORKING uncrippled product, maybe I'm a customer. Show me a useless crippled product, I'm very sorry to see real networks die as a viable company. Its not at all clear the paid version does not also cripple download video quality. got crippled unwatchable video downloads. endless popups saying please buy me. unrealistic pricing for market full of free video players. Good because it has video converter, that fit to powerpoint format.. For me RealTimes with realplayer is awesome, i can now work properly on my microsoft powerpoint like inserting video, bcuz it has video converter that fit to powerpoint video format. Very limited in working video/audio enhancement features, and program appea. This program has potential, but needs a lot of improvements and updating. Very limited in working video/audio enhancement features, and program appears outdated. **Video Downloading only work with youtube, Daily motion that I tested? ( Not work so far with hardly any other sites. most similiar downloaders/converters, even free ones can easily download from hundreds, and even thousands of websites. **Mainly wanted to use Real Player, to access and play all my Mp4 video playlists without lagging, like many people are doing these days, thru my ANDROID TV BOX 4.4 KITKAT device, from my WIN 7 PRO 64BIT PC and connected USB Drive, but when testing, Realplayer has bugs, it cannot even view any REAL-P videos downloaded or trimmed uploaded videos, (Black screen blocking videos while they play in REAL-P Android app), uploaded on to android player app, cannot even view to test playback quality &amp; resolution? **Realplayer android app cannot build or create simple video playlists? Or recognize Video Playlists created in REAL-P Windows PC?Or even play any connected USB external drive videos or playlists like other ANDROID players can? --Could not find any Option to Auto correct of video resolution, lighting or (Video sound problems like hissing and feedback, and able to save adjusted video to Mp4? --Why cannot download and save videos directly to MP4 like others? Real Times is Very Nice When Working. I Love Real Times, aka Real Player,I like being able to convert stuff, and copy videos, at least when I have it on my desk top. Several times, like now, I loose contact and wait for an e mail to re- down load. I am now trying to down load thru google listings.